Genie ... rising to jobsite challenges. 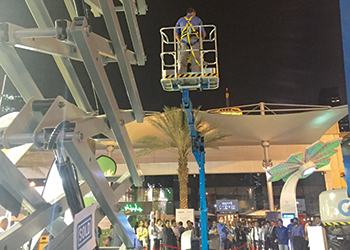 Terex Middle East held a live demo of its Genie GTH-5021 R at The Big 5 show in Dubai, UAE, last November, where it also showcased other Genie rotating telehandler models, namely the GTH-4016 R and GTH-4018 R.
The GTH-5021 R model has undergone stringent testing on the product testing circuit at Genie’s Umbertide plant in Italy, for hundreds of hours – the equivalent of 10 years’ of operation in a jobsite environment. The company has started delivery of six completely redesigned machines featuring updated engines, enhanced styling, capabilities, serviceability, and more interchangeable components and accessories. The Genie GTH rotating range is described as being remarkably simple and intuitive to operate, with the GTH-4016 R, GTH-4018 R and GTH-5021 R offering the ability to rise to the challenges of jobsites that demand equipment with long reaching and heavy lifting capabilities. Thanks to their intuitive controls – that make these telehandlers among the simplest to operate on the market – operators are immediately confident and ready to set to work rapidly, whatever their level of experience, said Terex Middle East. The three models offer lifting heights from 15.42 m to 20.87 m, lifting capacities from 4,000 kg to 5,000 kg, and up to 2,000 kg or 2,500 kg at maximum height. Meanwhile, the new Terex RL4 light tower was showcased for the first time in the Middle East at The Big 5. Terex said it has made significant design changes to strengthen Terex light tower’s reputation of being a reliable and cost-effective performer across a variety of jobsites. For instance, Terex said it has increased its run time by 50 per cent. Previously, the Terex RL4 light tower had a 30-gallon tank and provided about a 60-hour run time. Now it sports a 45-gallon tank and efficient Kohler engine, which extends the run time to about 90 hours. To make that run time even more efficient, the Terex RL4 has an optional autostart feature. In addition, the new vertical mast dramatically cuts set up time while the reduction of the footprint allows 17 units to be hauled on a 48-foot trailer instead of 10. This results in significant cost savings.